In which we happen upon a very big yellow jacket nest in our back yard. They swarmed for days. Six of us sustained multiple stings. Each. We took a lot of Benadryl. That wasn't so much fun. Winnie fell in love with bananas. I returned to the world of running. I was reminded of how hard it is to condition asthmatic lungs for exercise. And how many arthritic joints there are in my lower extremities. That wasn't so much fun. Seeing my hubby reach his fitness goals. Now, that was fun. Allen and the kids took up evening bike rides together. That was fun to watch. It will be even more fun when Winnie is big enough we can join in. My hubby road a pink bike through the Target parking lot. Cassie came for a visit from California. Now that was fun. The boys fell in love with this beautiful antique Mercedes. Ellie picked this bouquet from our garden for her friend at church. Pa had a big shipment wrapped in bubble wrap. Ellie thought that was fun. The girls made some movies. I crossed the Bay Bridge twice in one day. Alone. Without coffee. And lived to tell about it. (And if you don't think that is amazing you should know that the one thing in this world I am terrified of is bridges.) THAT IS 4.3 MILES. Just in case you were wondering. And since that was so much fun, I road a bike for the first time since we moved here.. and that's over ten years, folks. That was a little scary, too. And the girls not so much in a row boat. Than learns to drive a boat on his own. So, I know my blog has been very neglected the last week. But hopefully this quick little wrap up of our week will make up for it. More details to follow, hopefully, in future posts... Well, except for the bees. Hoping we are finished with those guys. 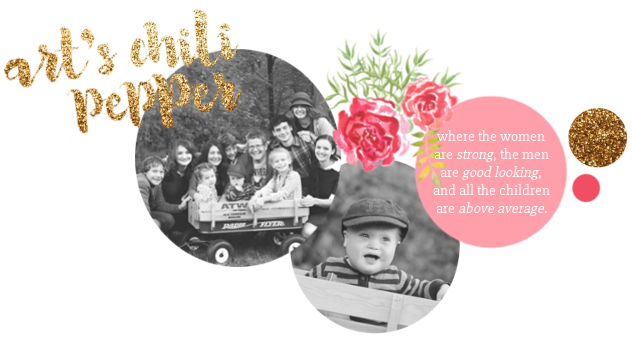 Hey, and by the way, don't forget to get over to Circle of Mom's and cast your vote for Art's Chili Pepper as your favorite large family blog. Remember you can vote once a day, every day, between now and August first. Your encouragement keeps this blog fueled for action! It sure was good to see you here today! Things have been exciting around here. Of course, there really is never a dull moment. I am glad to hear you are back to running, too. Hopefully you can keep the shin splints at bay. I had a very bad time with them about three years ago and I must admit I am very anxious about a reoccurrance now since I have not run seriously since before Carmella was born. So far, so good. It feels so good to be at it again. I have been going around 2 miles a day but this morning got in nearly 4. At this time I am keeping my goal basic. Because I have asthma it can often be very difficult to run. Conditioning my lungs for strenuous exercise can be frustrating at times. It goes like this. Run a minute... and I mean a minute... then speed walk a minute. Day two... Run two minutes... speed walk a minute... And so on. The goal is to get through without needing my inhaler. The first couple of days were rough. Somewhere around day 4 I was getting discouraged and just used my inhaler before I ran. Which worked like a charm. I was able to really go and keep a good pace. The last couple of days I needed no meds at all and, as I said, I had a successful four mile stint with five minutes of running and 1 minute of recovery. Yeah!!! I have never taken part in races because it is not my family thing. However, Allen is running now for the first time in his life and liking it very much. Emma is also enjoying it. Kaitlin will go running from time to time and the boys are interested in taking it up because their Pa is running. So I am thinking it would be a fun family goal to consider. When I successfully complete my five with no breathing issues (Which I hope to do before we go to the beach in September... I LOVE running on the beach!) I am going to bring the topic up for discussion. Glad to see you around and I look forward to hearing how that race goes in Ft. Wayne! My youngest has that same bike. I love riding down town to pick up stuff with it. Ahh.. the Bay Bridge.. haven't been there in FOREVER.. When I first got my learners.. my mom took me out there and made me drive across.. wow.. I learned to drive quick. It is fun to talk about our home town together. One of these days we need to get some hang out time when you come back to see the family. That is a good idea your mom had. My dad took me to an alley off of Bentz Street in downtown Frederick. He found the tightest spot he could between two vehicles and had me move into the driver's seat of his old VW standard transmission. We practiced paralleling parking for what seemed like all night. That was the hardest clutch of any vehicle I have ever driven. Anyway it worked. Everyone else was failing because they couldn't parallel park. My sister says I can parallel park a Mack Truck in a motorcycle spot. And I think she is right. I LOVE that bike, too. 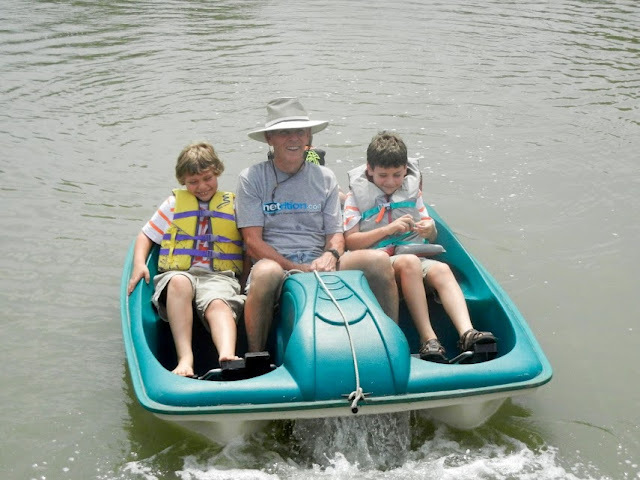 I have had fun riding it and look forward to more long rides up along the Canal when time permits. I haven't ridden since we moved here because there wasn't a safe place for the family to ride together. But now that the kids are older they are able to ride along our country roads. It was always one of our favorite family activities so I am excited to be back in the game. I think they make up that business about you remember it all when you get back on the bike, though. ☺ I was sure I was going to crash as I went speeding down the steep hills in our neighborhood. Glad to hear from you, my friend!